My Black and White Tuesday post included the news that I was posting a color photo of the evening sunset from the same Ferry trip on my new Facebook page. Several of you clicked over to take a look (thank you!) but Vastly Curious sent me a very nice note asking if I could also share the photo here for anyone who doesn’t use Facebook. If you have successfully managed to stay outside the reach of Facebook this post is for you. Thanks Nancy. 🙂 It was really cold but I’m happy most of the color came through in the photo. I was standing on the lower car deck as close to the edge as they would let me. I’m glad you like it Sue! Then I’m glad I posted it Bruce so you could see it today. 🙂 This is actually Mt. Rainier instead of Mt. Baker. With the direction of the boat there wasn’t enough light on Baker for a clear photo. My earlier, westbound trip had a beautifully clear view of it though. 🙂 I’m glad you enjoy Baker from Vancouver and Victoria too! I like the contrast between the water, land and sky–nicely captured. Beautiful capture! Love how the perspective and composition of the photo. I try so hard to avoid the Face Place these days, so I’m very glad you posted this one here. I love the way the water frames the mountain in the distance. Is that Mount Rainier? Thanks Andra, it’s good to know more readers get a chance to see it here. Yes, it is Mt. Rainier and if you look (squint) closely at the base of the mountain you can see the Seattle skyline. Thank you, I discontinued FB some time ago and this is certainly worth seeing, I can feel the cold and wind and love the colours. Thanks for sharing your comments Andy, I’m glad you got to see it here. These cold winter evenings certainly reward us with some wonderful colors. Then this post was for me! Beautiful! Yes, it was for you. :). Thanks for the request! Thank you for posting it here! 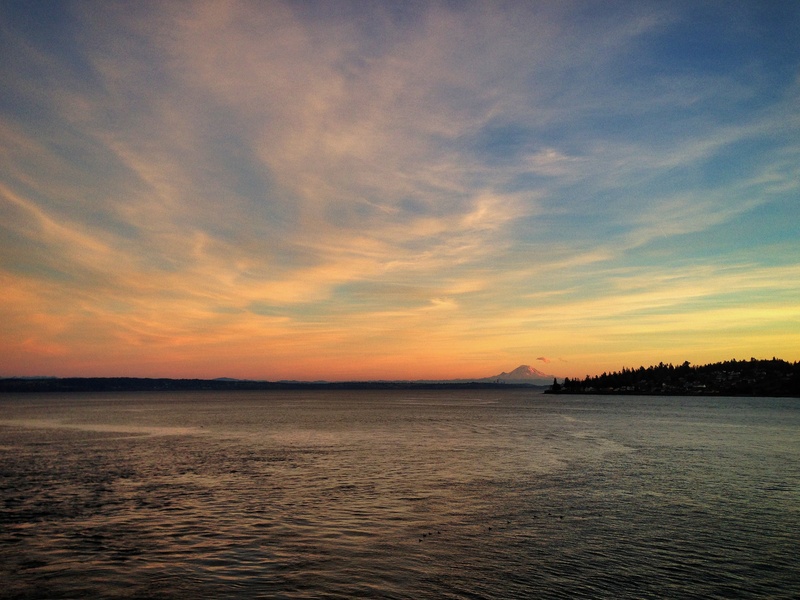 Mt Ranier is simply stunning in that light. What takes me away is the way the cloud wispy shapes are mirrored (not actually) by the water. See the same curvelinear shapes? wow, very striking. Mt Rainier seems so small in the background under that vast sky. i remember travelling down to Seattle with a friend who had never been there before, and had not mentioned Mt Rainier. it was incredible as we were driving along, because suddenly there it was almost up close and personal. a very striking landmark indeed. thanks for sharing this beautiful moment! You’re welcome! It’s always fun to watch someone see Mt. Rainier suddenly appear for the first time. 🙂 It usually feels so big, this smaller view across the water was a change for me. Thank you for posting it here. I don’t use fb :D. The site is breathtaking!